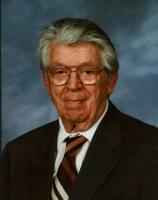 Sidney Wm English departed this life April 12, 2014. Sidney was born November 27, 1919 in Rome, NY. His parents were William A English and Hazel Furney English. He was preceded in death by his wife of 59 years, Alva J Sowles English; a grandson, Dean P English; his daughter, Alva Jeannine Shafer; three brothers; Leonard, William and Richard A English and a sister Eleanor Slocum. He entered the ministry in 1943 after graduating from Atlantic Union College in South Lancaster, MA. He ministered many Seventh Day Adventist churches through the years. Several in NY, KS and Colorado. After the death of his wife he moved to Mesa, AZ, where he has made several dear friends. He had a great and fulfilled life and accomplished many things. Sidney is survived by his dear friend of many years, Luella (Nelson) Donesky; his two sons, James S English (Linda) and David C English (Deborah); six grandchildren, Lori English (David) Wollaston, Jon (Linda) Shafer, Dawn Marie Trammell (Jason), Christina Coffing (Jeremy), Mark Shafer and David Wm Shafer, eight great-grandchildren, a sister Mary Jane (Joe) Shaben and many nieces and nephews.